We’re celebrating the start of summer by throwing a big Garden Party! Help us bring the whole community of South Belfast together & join us just down the road a bit in Drumglass Park (a.k.a Cranmore Park) for a fun-filled day of live music & delicious food and drink. 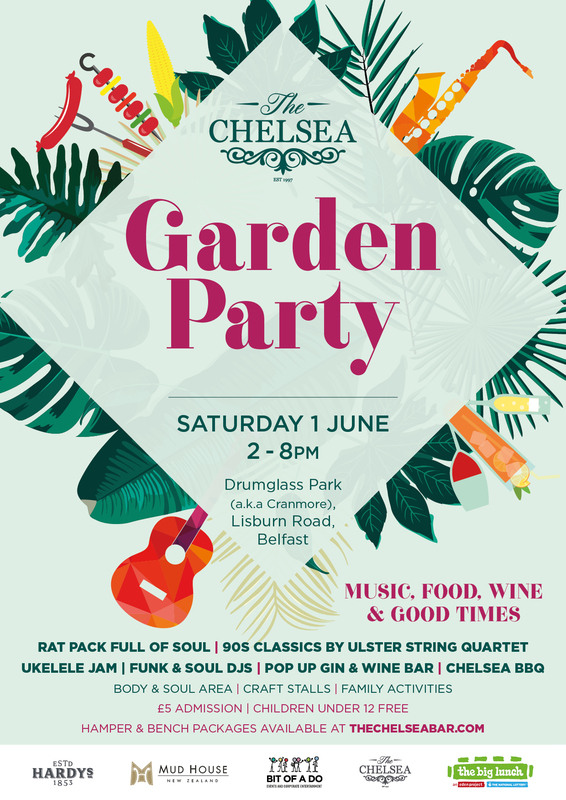 It’s the perfect opportunity to spend the day outdoors with friends & family enjoying a glass of wine or gin, grazing over delicious Chelsea style food and listening to some fantastic live music. Expect to hear these guys thrash out amazing string versions of all your favourite tunes played over the decades from The Beatles to Bruno Mars to Beyoncé. You’ve seen these guys go viral around these parts. They love what they do, and they love to show off their ukulele talent. They’ll have you and everyone else in the park singing along. For those looking to graze over delicious goodies all day you can pre-book a Chelsea Hamper for 2 – with savoury & sweet treats to be shared & enjoyed. Simply pre-book and collect at The Park! You can even book a picnic table with table service – now that’s the way to enjoy a Garden Party! We will also be serving up a delicious Chelsea style BBQ at The Garden Party – from gourmet burgers with Ballymaloe Relish & Fivemiletown Goat’s Cheese to Posh Dogs and Steak Melts. The bar will be fully stocked with beautiful wines from our partners Hardy’s VR & Mud House, Premium Gin Serves, Craft Beers & Foxes Rock. We’re also bringing in our neighbouring businesses from South Belfast to offer up some wellness, mindfulness & fun activities and offerings such as Yoga, Massages & Sound Therapy. Children are also welcome to come along with party games and crafts to keep them entertained. A child minding service will also be available so you can relax & enjoy the event. More details to follow. Dogs will be welcome in certain areas with free sampling of Frozzy’s Dog Frozen Yoghurt & a doggy yoga session too!